Some websites don't allow you to save your password in Firefox built-in password manager, for example Yahoo and Blogger. Really irritating! Someone might make a good use of it. I also hope someone will find a way or fix the yahoo login page. Enjoy! P.S. Make sure you install Secure Login add-on - it's a really handy application that allows one-click installs! We've seen the avian/bird flu to "fly away" from the media attention, as soon as a new wave of infection, called swine flu, popped out. There exist 3 main "types" (genus / species) of influenza virus - A, B and C. Their "subtypes" (serotypes / strains) are really easy to merge with each other and create a whole new subtype, which isn't covered by a vaccine. If you still didn't understand it, imagine crossing a black cow with a white cow and ending up getting a black cow with white spots (or vise versa) - that's a rather simplistic comparison! Now, CDC and the pharmaceutical companies (and subsequently the doctors that cooperate with them) warn about the widespread influenza virus infection. They expect the same or similar strains that have appeared so far. To some of you, this might look like "a big game" played by medicament-related companies. I have no idea what's going in the background and in the behind-closed-doors meetings, but one thing is sure: You have to be prepared. Note for employers: this really concerns you, if you don't want to have insufficient personnel unexpectedly! It may statistically be a pandemic crisis, but if people and public areas are well-prepared there's nothing to be afraid of. Quite honestly, I doubt anyone of you reading this post will face any serious symptoms. Surely pre-schools, schools and libraries can provide better hygiene control, teaching children how to wash their hands properly is a great way to start. Secondly, liquid hand sanitizers should be available in some rooms. Moreover, it should be possible to "recycle" the air in the premises, providing a fresh set every now and then; for instance, leaving a window open for a couple of minutes while on break. It's common sense that some people will get sick during the winter. That doesn't mean that they all will catch the bird or the swine flu. Babies should of course be taken care of and checked by a paediatrician, whereas adults and teenagers should also take precautional measures. Also note that one of the first symptoms is almost always a sudden fever, followed by a runny nose/sore throat/higher fever after 8-12 hours; they might not all be expressed and might be in a different sequence! There is one thing though in this whole bird/swine flu story that drives me nuts. The western capitalistic countries seem to be in a non-infective bubble. Many people in the least developed or developing countries don't have the adequate medical equipment nor the vaccines to combat and prevent the virus from spreading. Because of this, people might die, and only a few of us care. The media simply draw attention to what happens in the "western civilization", avoiding to show deaths that happen in other places of the world, where - under famine and food shortage - pathogenic micro-organisms spread wildly and only some of us provide help. If the flu was just a marketing trick to cause mass hysteria and sell out their vaccine merchandise, I have a brutal comment for such companies, but then again I prefer not to express my opinion. Brasero is a cd/dvd writing application for the Gnome desktop manager. Its advantages are ease of use, a lot of burning options and support for plugins! Everything goes well until about 50%. Afterwards, it continues, but the report does not show anything (empty progress bar). The speed is less than 2x, from 600 KiB/s to 800KiB/s, but the burning keeps going. Somewhere in the end, brasero shows progress again, but starts from 0%!! Note: You should consider that this might not always be your issue with slow speeds. For example, maybe your drive is not working well, or maybe your power supply unit (PSU) does not have enough "W" to supply all your hardware with adequate power. One of the developers detected and corrected the problem, which seems that it was using the wrong plugin ("wodim" instead of "growisofs"). 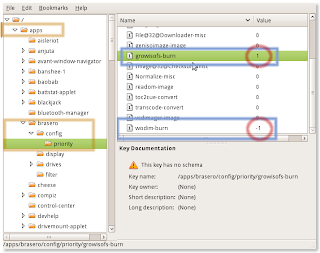 Since Ubuntu's binary package brasero has wodim as a dependency, it might cause problems if you try to remove wodim. - Head to apps ⟶ brasero ⟶ config ⟶ priority. - Change the number "0" next to wodim-burn to "-1" in order to disable it. - Change the number "0" next to growisofs-burn to "1" in order to set a higher priority. 2. Instead of using "Max" in speed burning options, set it manually at a high speed - e.g. choose 16x for a DVD or 52x for a CD.